(CNN) -- Ever wonder how your fingers can tell that silk feels different from paper, which feels different from wood? The ridges in our fingers didn't evolve just for identification purposes, experts say. Our ability to discriminate among different textures comes partly from our fingerprints, new research shows. Scientists say this study could influence the development of prosthetic hands for amputees, as well as for robotic systems. Previous studies have shown that humans can feel features about as small as the width of a human hair, roughly 200 micrometers. Now, a group of French scientists has found new clues into how fingerprints help code tactile information. They published their results in the most recent issue of the journal Science. The scientists studied the broader problem of solid friction, meaning what happens when two solid objects come in contact. They used a sensor covered with rubber to simulate a human finger and its interaction with the brain, so the phenomenon could be observed in a controlled setting. When the sensor's cap had ridges, like a fingerprint, it was able to amplify and filter certain vibrational frequencies, the authors said. The smooth-capped sensor did not do this. "This research might inspire future designs of prosthetic systems [robotic hands for instance] whose performances are to date far from matching those of the human hand," Georges Debrégeas, study co-author and physicist at the CNRS - Ecole Normale Supérieure in Paris, France, said in an e-mail. The findings are particularly relevant to Gerald Loeb, professor of biomedical engineering at the University of Southern California, who works on designing sensors for prosthetic and robotic hands. He called the research "an elegant study that shows the workings of the sensory apparatus that likely occurs in humans." Until recently, the actual tactile sensors available for prosthetic hands and robots have been extremely primitive, he said. Even after 20 years of research, the technology available has not been good enough for use washing dishes, gardening and other activities that involve handling sharp-edged objects. Loeb's group has developed a device that mimics human skin, but puts the actual sensors away from places where skin is likely to be damaged or worn out. The device's workings are based on similar principles discussed in the French study. Eventually, scientists would like prosthetic hands to provide information about an object's surface directly to the user, so he or she can consciously feel what the hand touches, Loeb said. The prosthetic hand of the future would also, like a real hand, tighten its grip on an object when it feels that it's about to slip, Loeb said. This reflex occurs because our skin ridges signal that the object is about to fall. As for robotics, the big immediate area of interest is in telerobotics, Loeb said. The idea is that a person would operate a robotic device remotely, but would receive or "feel" signals from a dangerous environment, such as a nuclear reactor or the surface of another planet. Scientists aren't sure exactly why our fingerprints evolved the way they did. Debrégeas speculated that the ability to feel fine textures may be useful for food foraging, and being able to tell the difference between edible and nonedible plants. "Texture perception might complement visual information in such classification tasks," he said. Other animals have bumps and ridges that correspond to human fingerprints, although humans can move their fingers with greater dexterity, Loeb said. There is evidence that these mechanical and sensory systems evolved alongside the central strategy in the brain that receives the signals. 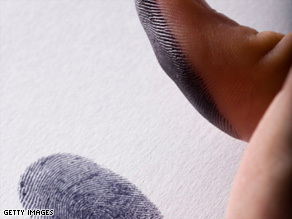 "Fingerprints evolved to augment sensory function while exploring objects. They're not just there for the benefit of the FBI," Loeb said.